In 2008, billionaire entrepreneur Mark Cuban wrote a post on how to get rich. In 2011, this same billionaire re-posted it again as the economy continued to go south. As I sit here in the wee beginnings of 2016, I’m left to ponder: does his advice still relate today? Does this billionaire still have his billions, and therefore any smart person should listen up and take notes? Has money really changed over the course of the last 8 years? I think we know the answer to these, but just for giggles why don’t we re-share them here and see what we’ve got ;) And for those who don’t know who Mr. Cuban is, you can check out his wiki here, but in a nutshell he’s a wildly successful entrepreneur who owns a number of businesses (Dallas Mavericks, Landmark Theatres, Magnolia Pictures), and is routinely featured in cult shows such as Shark Tank, Dancing With The Stars, Entourage from back in the day, and in fact my new favorite rap song out right now: $ave Dat Money. BOOM! Very much still accurate! Especially on the scheming and “getting in” on a great deal scenario – something I’ve never forgotten since first hearing that. If the deals were so great, why are they always talked about by those not wealthy themselves?? Raining even more truth up in here! Haha… I’ll politely disagree on not wanting to be rich if you use a card *ahem*, but by and large – yes. It’s all about that discipline (that discipline, that discipline…). Side 1 of the whole wealth game eh? Expenses. With the other one being “bring in more money,” of course. I don’t know about the whole CD thing, but still sound advice overall. Have I mentioned he doesn’t have a fondness towards the stock market? :) I’ll let you decipher for yourself whether you find this to be accurate or not, but personally I’d have 1/3rd the amount of money as I do now had I been sitting on the sidelines with cash the whole time… Regardless, hoarding it is a lot better than spending it so whichever strategy you choose you’ll reach the finish line much sooner than later. Good food for thought whether you like him or not! PS: He used to eat mustard and ketchup sandwiches back in the day before he “made it,” haha… Just proving yet again that we all start from the bottom! I love Cuban! Even if I don’t always agree with his ideas on things, he definitely brings the passion. Also, I’m sure he hates the stock market for the same reasons James Altucher says to not invest in your 401k – they are entrepreneurs. They want to create companies and invest in opportunities that come up quickly. You can’t always do that if your money is locked up in a 401k. Overall, it is terrible advice for 99% of the people out there which is why I hate it when people make such broad statements when the advice really only applies to a small part of the population. Great article. I like Cuban as he true is a rags to riches type story vs the “I was born rich and made myself richer” persona. I think his point of the 6 months cds is that you put it away somewhere that gets you a little interest but you cant have easy access to it. Sure, you can get it in 6 months if you have a major purchase (like a car/house) or an unexpected major expense comes up. But having it in a CD vs a savings account (traditional or online) means that when you want to buy a new outfit or the latest video game, you wont be able to tap into that money to make that questionably necessary purchase (not saying clothes and video games cant be bought, just that you should buy them sparingly and as needed, as opposed to chasing the latest fashion trends or buying whatever new game came out this week). Loved it. I was glad to see that so much of his advice was focused around using saving as the lead wealth building tool. Cuban, Franklin, Largo, J.Money, … we got savers all over the place don’t we. Thanks for sharing his sound advice. I just went and read his entire article and found another quote that I thought was worth sharing as well, he says, “Getting there requires being ready when opportunity presents itself.” This reminded me of Ford’s definition of Luck being when Preparation meets Opportunity. Once in a life time opportunities come our way all the time but if we haven’t prepared for them and can’t identify them, or have the money or knowledge to capitalize of it we will never know the chance we were presented with. YES! Should have totally included that one in the mix – good call. He was just in the news again this week with advice for the powerball winner. I’d take his advice. I think he makes very good points. Whether or not they’re the BEST options is questionable. But, his advice is definitely better than spending, spending, and spending. I’m excited to watch the clip later today. He’s a great motivator. Thanks for sharing! This is awesome, J! And honestly, this music video? IS GOLD. I am giggling at my computer and I’m sure my other early-bird coworkers think I’m nuts, but it’s so good (obviously, I’m rocking the requisite headphones, otherwise they’d probably be laughing too.) I’m off to check out the article about his advice for the Powerball winner – even though, as a Canadian who would have to drive 1.5 hours to score a ticket, I’m somewhat exempt from the madness and am currently ticket-less! I think one of the things that advice givers and receivers often forget is that there are three degrees of magnitude between millionaires and billionaires. Do you want to be a millionaire? Live like a millionaire. Live frugally, and regularly invest the difference. Do you want to be a billionaire? Live like a billionaire. Work like crazy when nobody believes in you. Go all in on your ideas. Bounce back from defeat after defeat as if you’re riding a tidal wave of victory. Marry someone who is much better looking than you and believes in your crazy ideas as much as you do (or get married after you’re a billionaire, but still to someone who is better looking than you). I have a dysfunctional relationship with the stock market. On one hand I get in the Warren Buffett mindset and think Buy and Hold!!! Then other days I think “This whole thing is one big scam… it’s not real!”…. I honestly don’t really know what’s the right answer. I’m sure it’s some where between Warren and Mark. Someday I may figure it out for myself. The timing of when you get in and when you get out changes everything too :) If you stay for 4 days it’s probably a scam, if you stay in for 40 years it’s probably genius haha… But hopefully whether you like/agree w/ the market or not, you’re at least investing your money *somewhere*. While Cuban is a very successful entrepreneur, and I like this article by J$ ( and the article he is quoting), there are some items that Cuban states that are just… wrong. For example, Cuban has stated that diversification is for idiots. And he is not a big fan of buy and hold. The funny thing is that the timing of saying that ( in 2011) was pretty bad. I think context matters here. For an entrepreneur who wants to build a highly scalable business with the goal of becoming a multi-millionaire within the next 5-10 years, then Cuban is right – diversification and buy/hold makes no sense. The way to achieve success in that context is to focus all of your energy and resources on 1 thing. For someone with a day job or small business who’s goal is to achieve financial independence comfortably and not to become “rich”, then diversification/buy and hold makes good sense. The comment from myself, from Bogle, and from others, relates to Mark Cuban promoting the idea of active short-term trading rather than having a diversified portfolio with minimal trading. The comment had nothing to do with being an entrepreneur. Perhaps if you had given the context of my comment at least a tiny little bit of thought, you would not have made your comment in the first place. I have actually given it a “tiny bit of thought” given that I’ve been reading Cuban’s blog since the 00s, but fair enough – I did hit reply to your comment and didn’t directly address the click bait, cherry-picked headlines you and Jack were referring to. This is mass media, so take the “diversification of idiots” and “buy and hold is a crock of sh*t” quotes with a grain of salt. Marc Cuban is an opinionated guy and he has a tendency to give mass media the controversial sound-bites they LOVE, even when his actual thoughts are more nuanced. First of all, Cuban says “buy and hold is a crock of sh*t”, but the context is that he’s disagreeing with what everyone tells HIM he should do as an investor. He personally disagrees with the idea that you ALWAYS have to invest your cash in the market. He’d rather sleep at night and keep his money in cash most of the time, unless he feels he has an edge somewhere. Later in the interview he circles back to this and acknowledges that this might only work for him because he doesn’t need to live off of his investing returns. For him, “buy and hold is a crock of sh*t” because it implies you always need to have cash in the market. But for Marc Cuban, the 2% he might lose to inflation seems to be less of a concern to him than having his networth fluctuate by 200-300 million during a correction. It seems reasonable to me that Cuban with his resources has a different approach to investing than someone making 80k a year trying to retire in 10 years. Then, Marc Cuban says specifically that the average investor these days SHOULDN’T be actively trading because they’re competing against huge hedge funds and algorithms that have all the edges. He says he’s been warning people against actively trading since the mid 00s. Funny that the WSJ didn’t pick this as a headline. Not controversial enough. He includes himself as an “individual trader” and says unless he knows something specific, he will keep it in cash. He acknowledges that he’s in a different position than most people, because he’s not relying on investing returns to pay the bills. He does go into some moves he’s made personally when he thinks he ha an edge, but even when pressed by the interviewer, he never suggests anyone else should try to copy him. The interviewer gets tired of hearing about what Marc Cuban does, so he pushes Marc to tell him how “john and sally doe” should invest. 2. First thing you should do is pay off all credit cards because it’s costing you 18%, but most don’t. He references the tremendous amount of credit card/student loan debt the US has. 3. Use the transactional value of cash. Basically keep lots of cash and buy stuff when it’s on sale and stock up because it’s a guaranteed return. It’s actually hilarious to hear Marc Cuban talking about stocking up on toothpaste like a Frugal mommy blogger on the WSJ. 4. He says you should concentrate on your budget and analyze your spending habits instead of worrying bout investing, since that’s a guaranteed return. Basically, all the exact same stuff he wrote in his “how to get rich” blog post from years ago. At this point, the interviewer is sick of all this boring, sensible personal finance stuff, and presses him on what he thinks the average investor should do with their money if they HAD to get a return. 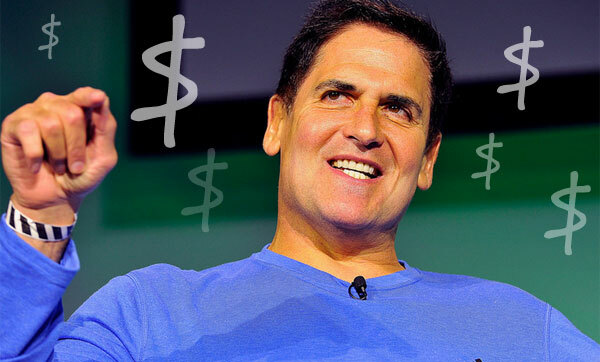 But Marc Cuban disagrees with his premise that you need to get a return. He says he’d rather sleep well at night, but ACKNOWLEDGES that he’s in a different position than most where he doesn’t have to live off of the 1% return on cash. So basically, Marc Cuban thinks the average investor should pay down debt and focus on personal finance instead of worrying about squeezing out a return in the market. He thinks the market is being abused by hedge funds and algorithmic trading. When forced to give investing advice, he sidesteps the question and says what HE personally would do, which is hold his money in cash so he can “sleep” at night, and only invest in something where he thinks he has an edge. I think that’s pretty important context to keep in mind when reading those 2 quotes you’re referencing. Also I just went back to read his original post on asset allocation and you’re totally right that he advocates against buy and hold specifically for the average investor. I didn’t remember him taking such a strong stance against asset allocation, so I guess I didn’t give my comment as much thought as I should have. My mistake. In my mind, I always interpreted his comments from the pov of an entrepreneur, and I agree with the general idea that you should invest in things you know whenever possible. But I do agree with you that maybe for the average investor, asset allocation and index funds is a good thing and not a wall street trick. Great discussion going over here y’all, love reading about all this stuff! Lots of good points, though I think it’s cavalier to say that you don’t care about money if you use credit cards. I think maybe you don’t care if you use cards to buy things you can’t otherwise afford, as opposed to a short term way to cover unexpected expenses, preferably just til payday. But plenty of people use cards smartly and benefit from them. And plenty of people need the backup of a card, especially of they keep their extra money in online banks to get better rates. I really appreciate that Cuban doesn’t discount the power of frugality, especially in order to save cash and get the ball rolling. I think some of his advice is divergent from the “save and hold” approach many in the FI world take because he’s got different goals. If you want to work super hard in a business you love and get super rich, his advice applies. If you just want to quit the race early, you might take a different approach. Great food for thought, J! He certainly tells it like it is! It’s really doing the basics — spending less than you earn (the larger the gap the better) and investing for a decent return (not a 30% proposed return as part of a scam). Do that for 30-40 years and you’ll see your wealth grow and grow. Exactly! So glad you took that away with you, Cecilia. Such a bit part that people often forget! Great advice from Mark Cuban. I love listening to wealthy people who have actually achieved something, since their advice comes from experience. Though yeah, I don’t agree with everything he says. Much of it seems geared to complete financial novices instead of those already on the path to building wealth. Yes, I love this! I don’t necessarily agree that buy-and-hold is a fool’s game, but there is much to be said about having cash available to take advantage of certain opportunities. Cuban has a lot of good, practical advice. Much of it seems to be based on the concept of self-awareness. You need a plan and to really think about where all of your money is going, in order to get rich. The other requirement is diligence. These are great things to keep in mind as we all get pumped for making the most of 2016. I’m a huge Mark Cuban fan. He actually has a short book which is a bunch of his best blog entries edited to book format. It’s short (about 75 pages) and I read it on one flight. I thought it was great for what it was, and recommend it. Interesting- thanks for sharing. I will try to check it out! I’ve always loved Cuban for his no-BS type of attitude. He certainly provides a lot of good, practical advice. Great reminder. Mark Cuban really did a good job with connecting to the everyday citizen here. Gives me hope to continue to save and make smart investments! People typically love him or hate him :) He’s pretty feisty and tends to say whatever’s on his mind, haha…. I don’t really know that much about Mark Cuban other than he owns the Miami Heat (?) and is on that show…it’s clear that I need to read what he has been writing because I agreed with all of the comments that you shared (that he made)…except for the stocks. Now I need to read his whole story! Anyone who’s a straight-talkin’-mustard-‘n-ketchup-sandwich-eatin’ saver is alright in my books. Bet you he had water with that. I’ll pay more attention to what he has to say from now on. Thanks for highlighting him. I love Mark Cuban. Such a down to earth billionaire. The comment Mark Cuban said about it being a get rich path, and not a get rich quick scheme was perfect! Solid dissection of his comments J. Money. The Cuban post was timely in 2008 and still today. Hard work and discipline create the luck that will always win. Thank you for posting. Great advice J Money – thanks for pulling out the gems for us. I still don’t agree with the credit card and stock market views – but I get the points he is trying to make. 1) don’t borrow money for personal expenses, 2) money invested in your own businesses can return much more than money in the market. A good attitude is really a factor in getting rich. It’s like without it, you would have a hard time getting rich. Be nice to everyone even if you’re the richest person on earth. Sharktank is one of my “boring” tv guilty pleasures. Mark Cuban rocks. The stock market has me nervous to invest at the moment in Canada. Awesome, I didn’t know the guy, but now I think I’ve found a new blog to add to my daily reads, thanks! Next post: How to Make $25-50/hr as a Freelance Bartender!